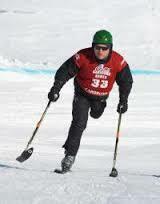 Skiing / Riding is for EVERYONE!!! 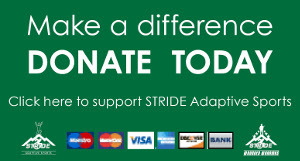 STRIDE offers adaptive skiing and snowboarding lessons at four mountain resorts in New England: Jiminy Peak Mountain Resort in Hancock, MA; Catamount Mountain in Hillsdale, NY; Ski Sundown in New Hartford, CT, and Yawgoo Valley in Rhode Island. Our volunteer coaches teach over 2000 annual lessons during the winter to individuals with developmental, intellectual and physical disabilities. Private adaptive lessons are offered for 2.5 hours, and lessons include specialized equipment and rentals. Lessons run from December to April. We offer lessons for mono-ski, bi-ski, visual or hearing impaired, intellectual disabilities, 3-track, 4-track, and adaptive snowboarding. Advanced reservations are required. STRIDE is an official PSIA-E member school as well as a member of Disabled Sports USA, a Paralympic Sports Club, and Special Olympics Training Club. All lessons include adaptive and standard rental equipment. 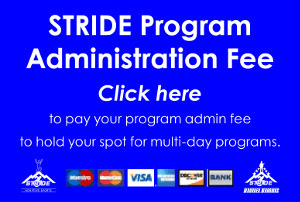 To find out more information or to register, contact mevans@stride.org or (518) 598-1279. NEW! STRIDE Sliders Program! Enjoy a group mountain lesson program with other students who are same ability, to promote socialization skills while improving skiing/riding skills. Participants must purchase a package of 6 lessons for the discounted price of $360. Times offered will be Saturday afternoons and Sunday mornings. Join the STRIDE Race Team! Competition for both Special Olympics and Dianna Golden Race Series. Team practices on Saturday mornings. To register, contact Ski Sundown Welcome Center: (860) 379-7669. Handicap parking is available on the left and right of the main footbridge entrance. Complete the Adaptive Application & Waiver. Your application must be accepted by STRIDE prior to making a reservation with Ski Sundown. Call 860-379-7669 Ext. 211 to make an adaptive lesson reservation. All reservations are charged in full when booked. A full refund will be issued if cancelled at least 48 hours prior to the reservation. Reschedules made within 48 hours are subject to a $25 fee. In case of cancellation, please notify Gail Tagan.